Validating satellite data for many missions is an ongoing task to ensure that the satellite data are accurate. This means taking measurements out in the field, either on land, at sea or from the air to compare with data delivered by the satellite in question. While much work has been done for validating Copernicus Sentinel-3 ocean-colour data in the open ocean, coastal zones present a more complex environment. Coastal waters are subject to land and river runoff, which leads to suspended sediment and therefore they are more biologically active that waters of the open ocean – and coastal water conditions change all the time. Sentinel-3 is a two-satellite constellation. Each satellite carries the same suite of instruments to measure Earth’s oceans, land, ice and atmosphere. One of the instruments is the Ocean and Land Colour Instrument which, as its name implies, is used to map changing land cover and to monitor ocean biology and water quality. Satellite measurements of the water surface are essentially a combination of the solar radiation reflected from the surface and solar radiation, which has been transmitted through the water and then reflected back out. The atmosphere has a large impact on how much of the radiation leaving the water surface reaches the satellite, which can introduce significant errors if not correctly accounted for. By observing the radiation at the water surface using a buoy and comparing it to the satellite measurement, the effect of the intervening atmosphere can be removed, to ensure that the data coming from the satellite are correct. However, carrying out validation campaigns from in-situ platforms in high-latitude coastal zones is difficult because of changeable ocean currents, wind direction, tidal flows and more turbid waters. These factors can influence ‘bottom reflectance’, for example, which can make validation highly location dependent. Also, light from Sun comes in at low angles at high latitudes, which also affects in-situ measurements. 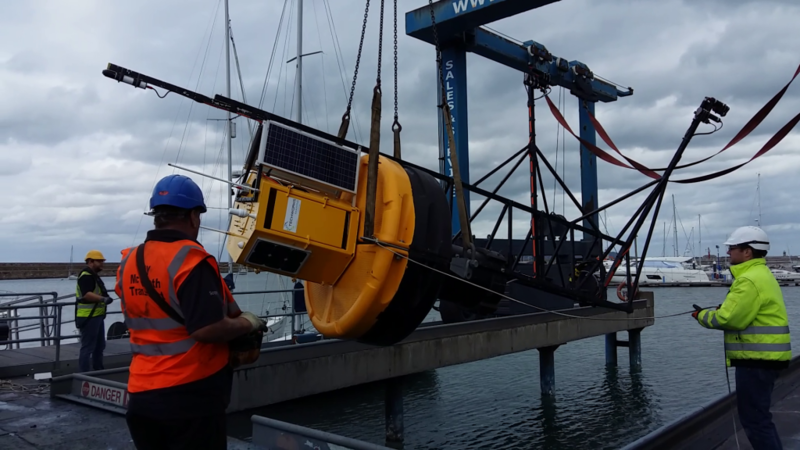 With the challenges of the coastal environment in mind, TechWorks Marine has designed the CoastVal platform to explore how suitable this kind of buoy would be for making in-situ optical measurements. 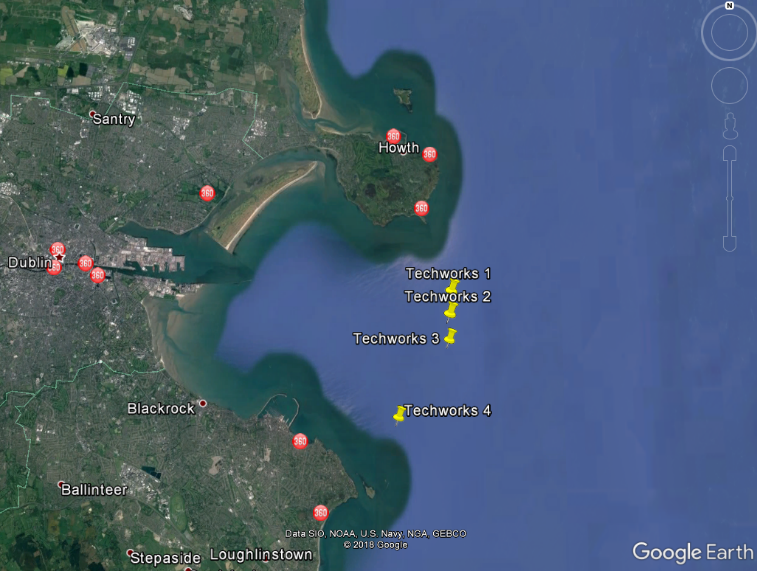 The team has been working off the east coast of Ireland in the Dublin Bay area to test the validation sites. This has involved finding the optimal depth for the sensor in coastal waters, checking on the tilting dynamics of the buoy as well as self-shading the sensors. Optical and other environmental sensors were deployed on the buoy as part of the system, with data transmitted to the TechWorks Marine CoastEye data platform for inspection, processing, analysis and visualisation. 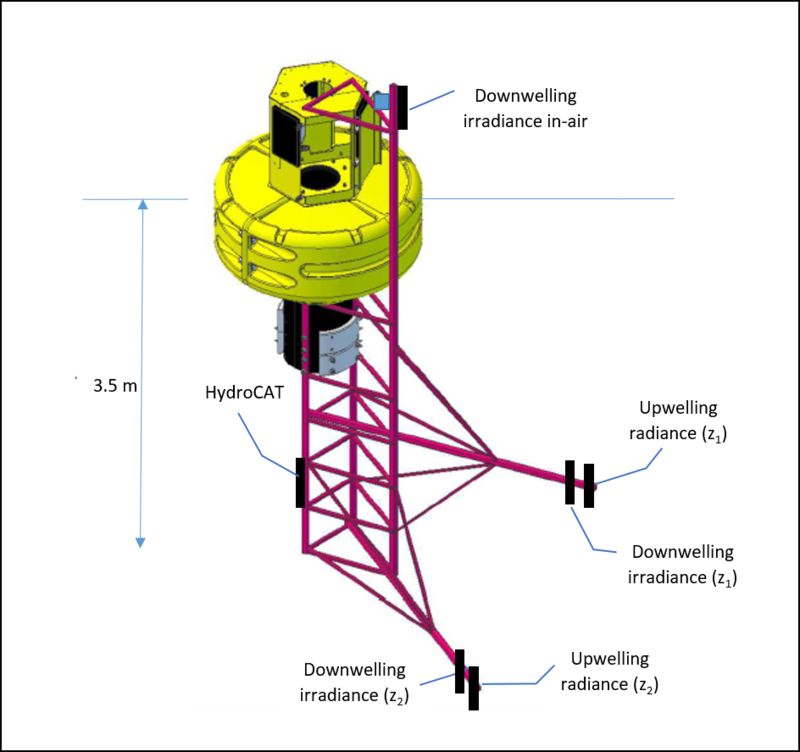 The optical sensor system consisted of two pairs of up- and downwelling spectral radiometers positioned with a fixed depth separation in the water, with a third sensor mounted in air atop the buoy platform to measure the downwelling irradiance. The team has done a lot of work to account for a range of effects, from tidal currents to buoy and instrument self-shading. 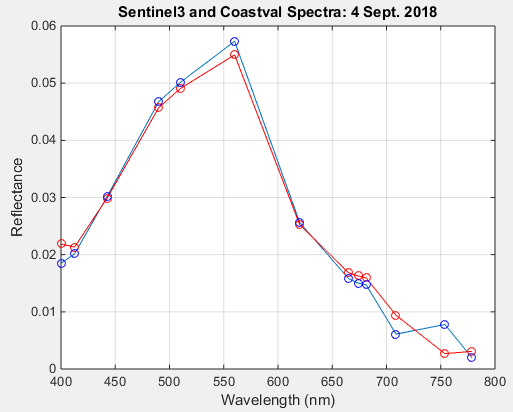 Preliminary analysis indicates an excellent matchup between the in-situ CoastVal data and data from Sentinel-3.